Hi! I'm Poppy! I'm a beautiful girl and I'm looking for my forever peeps! I just gave birth to six kittens, and that was quite a life-changing experience --- so now Summit Dog Rescue is looking for a great new home for me. They like me so much they've even put me in the official Dog Gallery! "Poppy less than a year old and is a super sweet, green-eyed beauty. She gave birth to her six kittens on August 16, 2017, and now that her kittens are weaned she's on the hunt for her forever home! She's affectionate and loves people and attention. She's a chatty, charming girl who is tolerant of the two male cats in her foster household, and she does OK with respectful dogs. She loves sitting in your lap and is constantly purring or talking to you. Poppy always has something to say! She just wants to be loved." 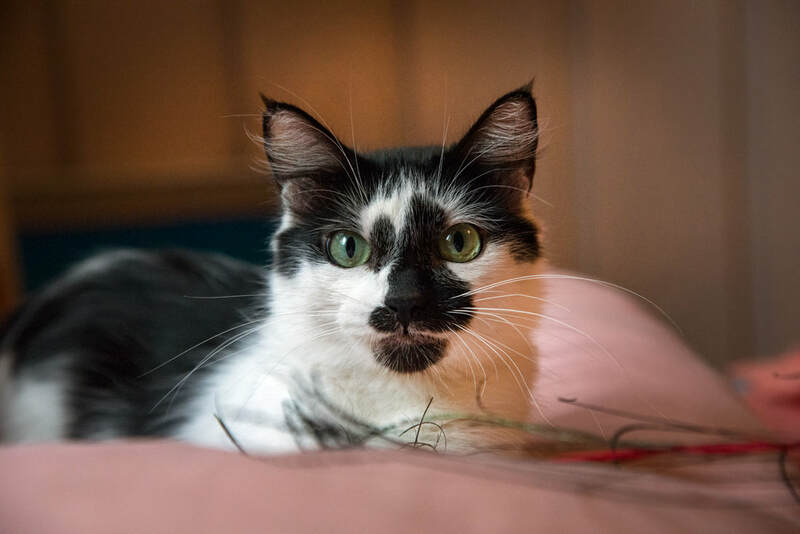 So if you're looking for a gorgeous, soft, snuggly, friendly girl who loves hanging out with everybody -- not to mention my amazing face painting -- I'm your girl! For more info and/or to apply to adopt me, go to the top toolbar, click Adopt, click Kitty Application, the fill it out and send it in. A nice volunteer from Summit Dog Rescue will get back to you as soon as they can.